All my whips roll on SunTour. 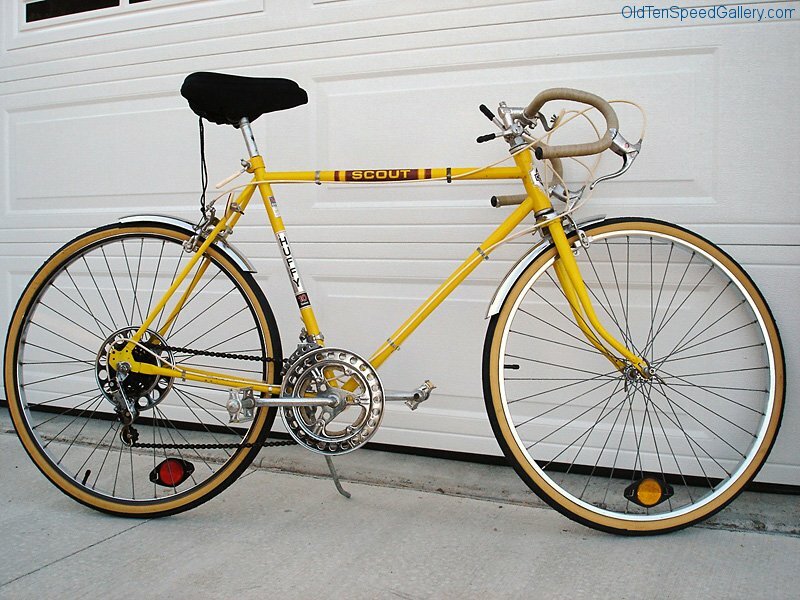 Another mystery marque: this is Sean J.’s Trident 10-Speed. Very comparable component-wise to James’ Huffy Scout, but the lugged frame is clearly not a match. Also note the inverted rear brake! And center-pull no less! I wonder what could have inspired that setup. I picked up this Trident as part of a package deal with a Motobecane. I noticed that it had a dented frame, but other then being dusty, it was all there. After just hosing it off, this is how it looks. I was going to use it for parts, but there is something about it, that wont let me. 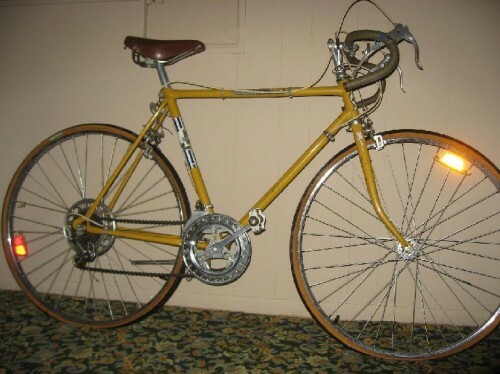 I was also hoping that someone can tell me more about this bike, and Trident bikes. All I can tell you is what you can see. Cottered cranks, a neato shimano eagle rear derailieur, stem shifters, spot welded dropouts, blah blah blah. If anyone is interested in this OTS, let me know. I would buy it, it looks cool. Where are you located? Sorry, I have not checked this site for a while. I am located in Des Moines, IA. If you are interested, leave me a way to contact you. Hey Sean – I have one just like it, except mine is green. I got it new around 1970-71-ish. I have been riding it ever since. (As I write this, it is 2017.) Over the years, I have replaced the seat twice and recently put a new kick-stand on it. Other than that, just regular maintenance. Great bike. Wouldn’t trade it for the world.